When you are looking for a car to drive through sand trenches, over tree limbs and reverse from charging elephants you’d better make sure that you trust the person handing over the keys. We got lucky. By lucky I mean we did hours of research into South African safari companies, and the details we were looking for in a car. If you read last week’s post on why we decided to drive ourselves through Africa you will realize the number one theme of our trip, we had no idea what we were doing. Finding a car when you have no idea what you are looking for is tough. In our case, Heather from Bushtrackers made our search instantly clear and our trip quickly fell into place. Responsiveness – Heather was available and ready to answer all of my questions. She was able to answer in detail and calm any nerves I had about the trip. This assured me that if we did have an issue on the road she would be quick to respond and help us. If your car hire company is lagging in responding to you, I would question the ease of the rest of your trip. Above all you want the company you work with to be available, especially if you do have an emergency while driving. There are a lot of opportunities for something to go wrong so make sure you have backup ready if you need it. Attention to detail – We learned that Harry refuses to hire out his cars with a repaired tire, even if the puncture was small. You can tell he cares about his clients safety. We were given instructions on how to adjust the air in our tires for better traction on the gravel roads in Namibia. Every truck you pick up is equipped with clean and reliable equipment with a detailed explanation on how to use everything. Informative – Heather was not only quick on her email, but was very informative with everything from the weather to route suggestions and what I should expect throughout the drive. For a couple few weeks I sent at least 1 email to her each day and she not only responded to each question, but usually added extra information that I wouldn’t have even thought to ask. We would have missed out on some great experiences if it wasn’t for her advice. 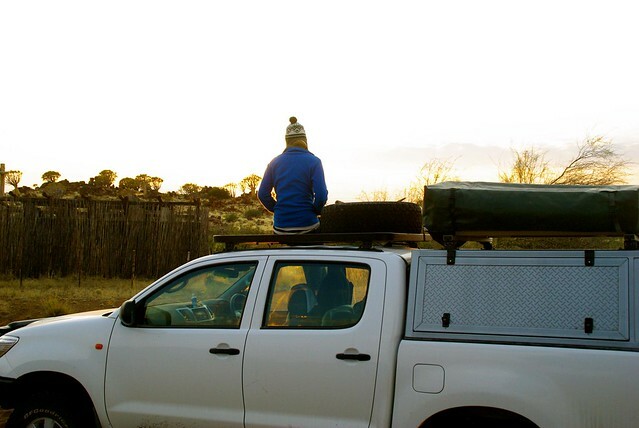 Unmarked – When I began searching for a 4×4 camper this was not on my list of requirements. After 3 weeks of driving and camping I realize how much of a benefit this is, especially when you drive through towns along the way. Your car is already a target with a big green tent on top, adding gaudy advertisements and company logos onto your car only screams louder, “I AM A TOURIST! Come see what I’ve got in here!” I loved that our car was unmarked as it made me feel much safer and less conspicuous. Organized – I enjoy doing most of the planning myself and consider myself rather organized, but on this trip I let Heather take the reins. Upon arrival she handed us a folder with all of the important border crossing documents we needed. Harry walked through the maps and directions with us, everything we needed for 3 weeks was in this one green folder. Before I could blink she had arranged a taxi to and from the airport along with a hotel in our price range for the night we returned. This family-run company definitely goes the extra mile. Bushtrackers was one of the main reasons our trip was as fantastic as it was. We fell in love with the car and were sad to leave it at the end of the trip! Disclaimer: We received a discount from Bushtrackers. As always, all opinions are our own. I second all these comments. 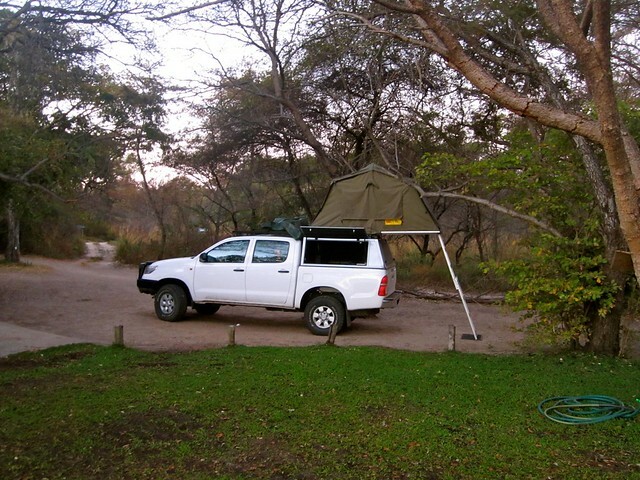 My son and I also had a wonderful experience with Bushtrackers on our recent trip to Africa and enthusiastically endorse them as a great safari truck source for a Southern Africa trip. The best parts of our trip were dealing with Bushtrackers and meeting the Eatons on their incredible journey. I’m an old guy now, retired, and still am taking a couple of big road trips a year. I took a similar trip to the Eatons along the overland to Asia and Africa Hippie Trail with my son’s mom in 1973-1974 and still think about it every day. The Eatons are building a lifetime of memories. folks like Heather at Bushtrackers just make those memories better.